Although founded in the early 20th century, the L.C. Bates Museum, in Hinckley, Maine, is a throwback to an even earlier time, when many museums were more or less random collections of oddities. Here you will find biological specimens, works of art, and anthropological artifacts side by side, many of them labeled poorly or not at all and too many deteriorating from a lack of care due, apparently, to a paucity of funds. Nevertheless, it's a fun place to browse on a short visit, it's cheap ($3 for adults), it's on the way to good canoeing and rafting in northern Maine, and it contains a couple exhibits of interest to us. 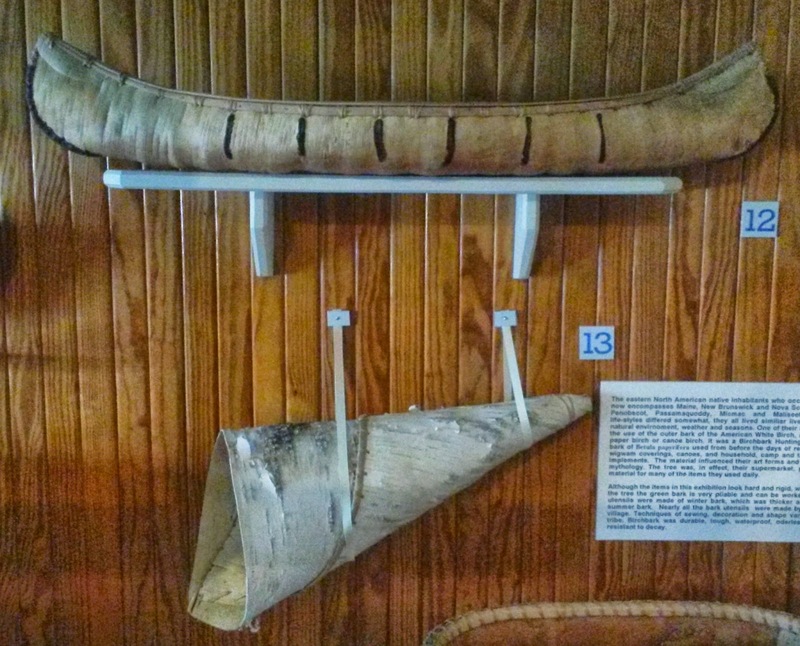 One is about Native American (primarily Maine) birchbark technology; the other displays Greenland Inuit artifacts from the first decade of the 20th century. 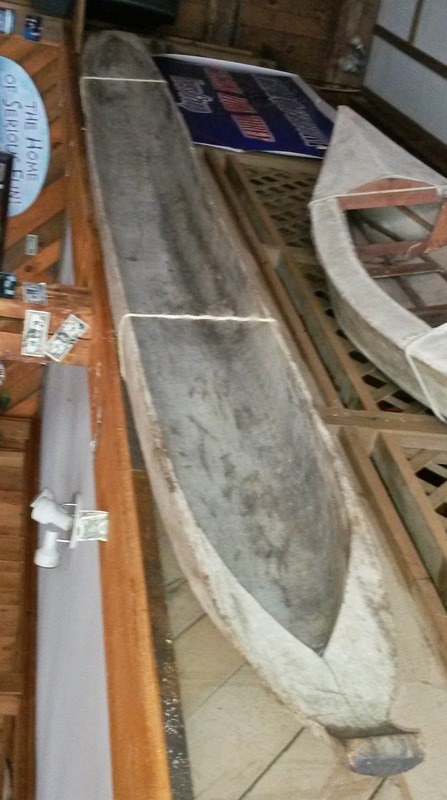 This bark canoe model is over 3' long. It's decorated with hundreds of dyed porcupine quills, both ends of which are tucked into small holes pre-punched in the bark. Although the exhibit card says that it's "likely mid-west in origin," the ends are exaggerated representations of those on Canadian fur trade canoes. From the exhibit card: "This old, well-made model is an example of the thousands sold to Maine tourists in the late 19th and early 20th century (sic). This canoe shows how heated tree resin was used to seal and waterproof the birch bark joints. The word for canoe in all Abenaki languages in Aquiden." Below the canoe model is a moose call, also made of birch bark. An Abenaki canoe paddle, "of a size suited for teaching a young person the art of propelling a canoe." 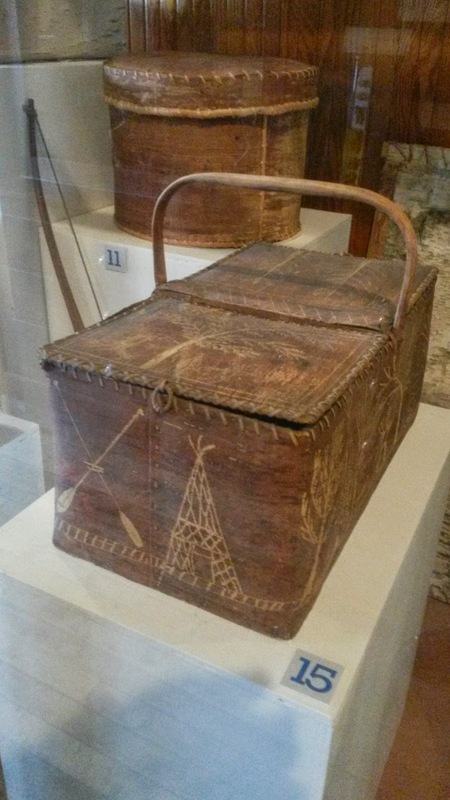 A 19th century box with hinged covers, probably Penobscot, probably made for the tourist trade and intended for use as a picnic hamper. The crossed paddles and tepee designs -- of poorer quality than the box itself -- are incised in the bark in the same manner that canoes were decorated. 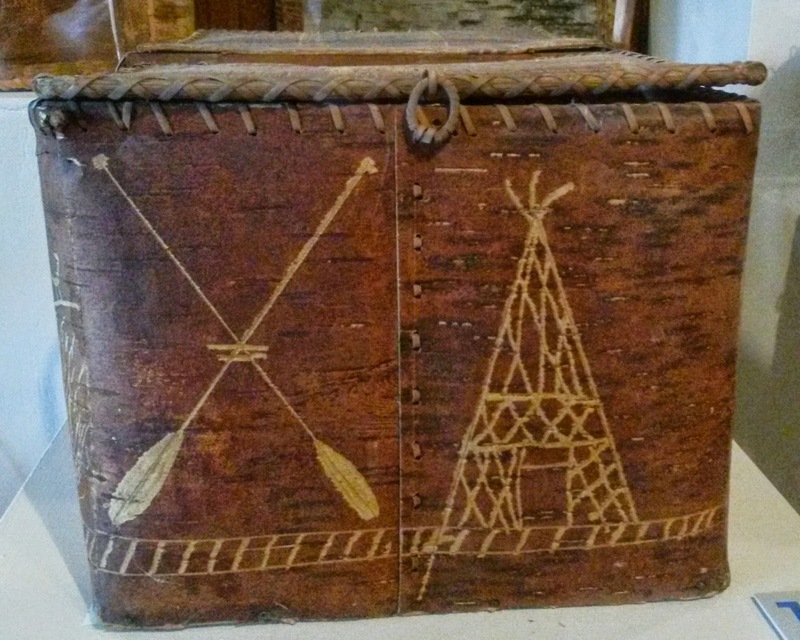 Perspective view of the same box, with a round covered box, also of birch bark, behind. The exhibit card identifies the miniature kayaks in this and the following photo as toys, made for indigenous children. This may be incorrect: except for the wooden one (above, right), they were probably made for the tourist trade and/or upon the request of researchers or collectors. 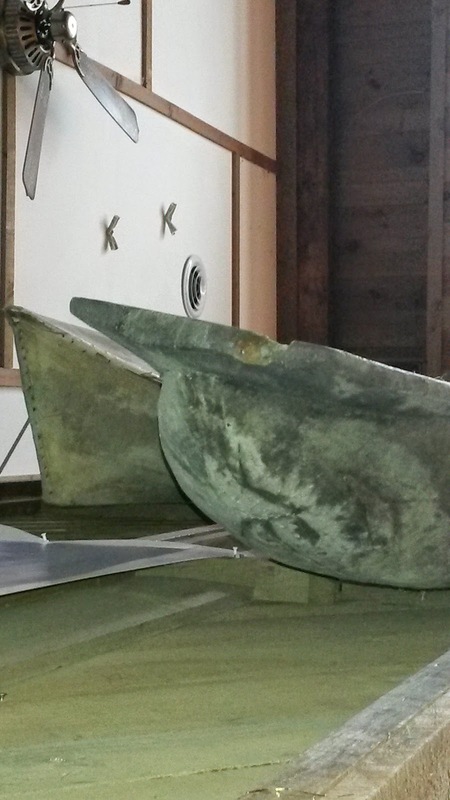 The one above left is ivory, and the kayaker's hand is made to hold the harpoon that rests across the cockpit coaming. Two nicely authentic skin-on-frame kayak models. The Greenland kayak was essentially a hunting tool, used primarily in the pursuit of seals and walruses. 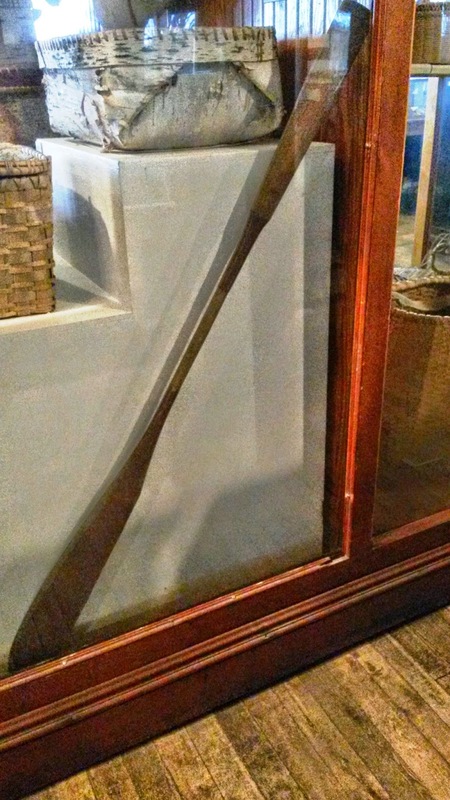 The main hunting weapon was a harpoon with a detachable head or foreshaft. 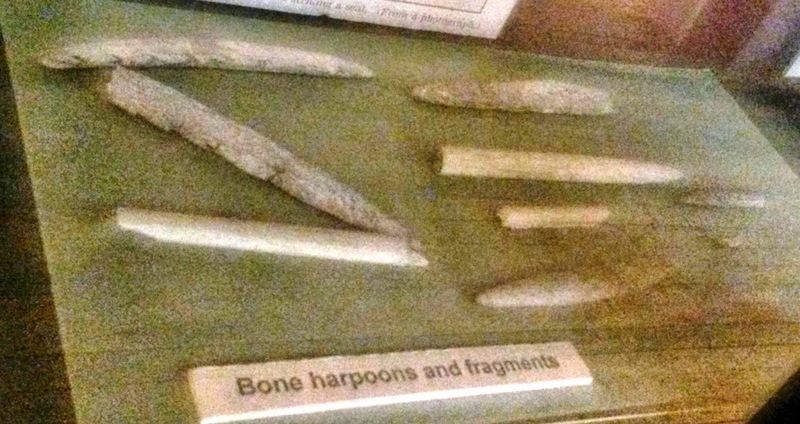 The largest of these bone harpoon points and fragments are only about 4" long. Yesterday I received training in first aid and CPR at Three Rivers Whitewater in The Forks, Maine. (The town is named for the confluence of the Kennebec and Dead rivers.) 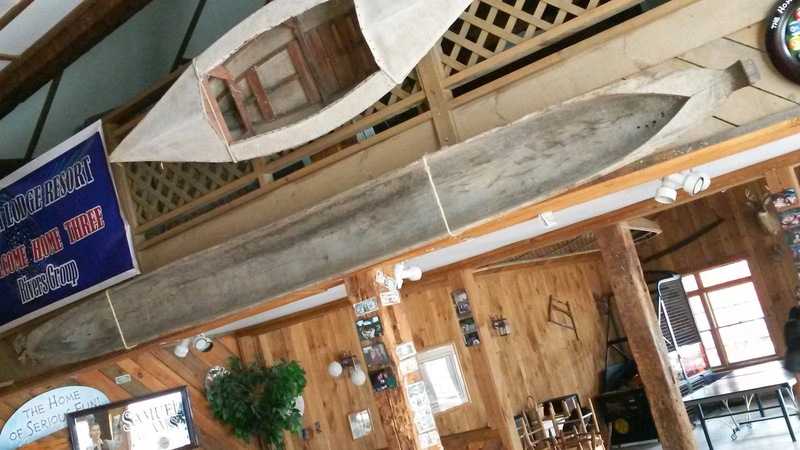 This whitewater raft trip outfitter runs The Boatman's Bar & Grill, the interior of which is decorated with several interesting boats, prime among them a 20th century dugout canoe from Nicaragua. The boats are displayed on walls and ceiling. I've rotated the photos for the most logical view of the boats, but the context may appear confusing for that reason. We'll begin with three full-length photos of the dugout. We're looking at the bow here. The sides of the boat are thin -- about 1" thick. The ends only appear to be thick and heavy, and what we're seeing here is actually an overhang beyond the buoyant section of the hull. View from the stern. The hull is carved from the trunk of a conifer that is known in Nicaragua as a spruce, but it is a far harder wood than northern spruces. I estimate overall length at 16', and maximum beam around 14". The bow shows substantial overhang. The hull bottom is somewhat flattened, but the sections are quite round overall. With its narrow beam, this must be a rather tippy boat. And given its extreme length:beam ratio, it would be fast but very difficult to turn. Definitely a craft for protected waters only. Top view of the bow, showing the stem decoration. Top view of the stern. The sharply-pointed shape of the carved interior contrasts nicely with the rounded end of hull's exterior form. As at the bow, the apparently heavy stern is actually an overhang, and the stern itself is not much thicker than the sides. Side view of the stern, showing the round hull and overhang. 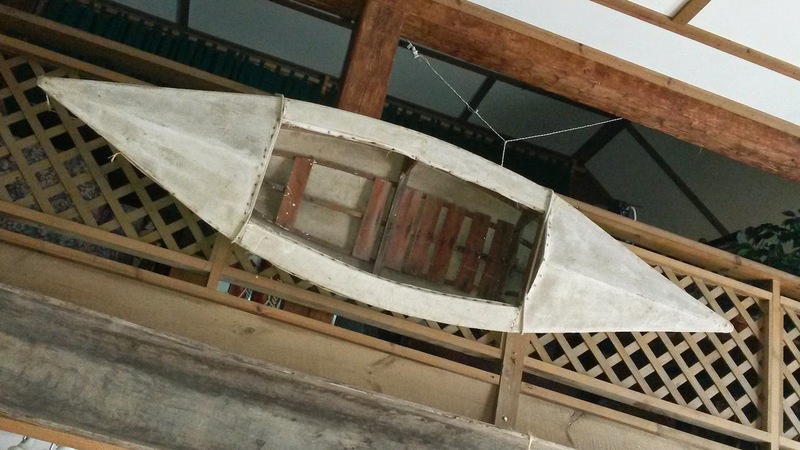 Hanging just above the dugout is this canvas-on-frame double-paddle canoe. It was built by a member of Rhode Island's Haffenreffer family, famous as the brewers of Narrangansett Beer and benefactors of the Haffenreffer Museum, Brown University's museum of anthropology (which, by the way, possesses some excellent, very old Inuit kayaks). 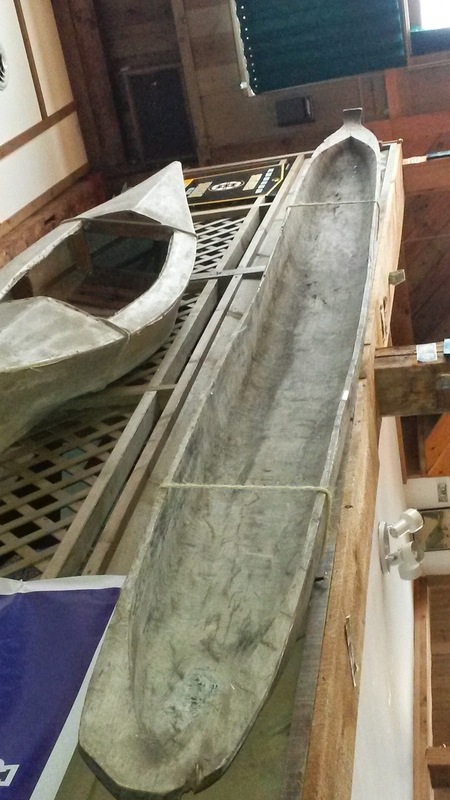 Looking at the bow of the Haffenreffer canoe. This looks like a handy, stable, fun boat for exploring tiny streams and backwaters. 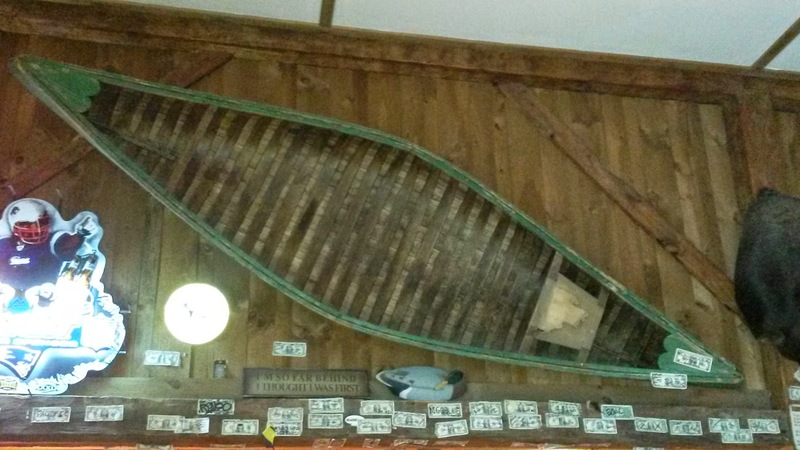 A square-sterned "Grand Laker" canoe is hanging upside-down from the ceiling of the dining room. Probably from eastern Maine (i.e., "down east"), the cedar hull was once covered with a canvas skin. It looks to be in good condition. The Grand Laker has rather square sections amidships, half-ribs between every rib, a full-length keelson over the ribs, and four nicely-proportioned thwarts with a subtle arch. Another canvas-on-cedar canoe, this one a double-ended solo boat with nice heart-shaped decks (unfortunately painted, not varnished). The presence of a seat in the stern is surprising, as a paddler sitting there would make the boat extremely stern-heavy. It's probably less than 12' long, so it's unlikely that it was used for extended tripping with loads of gear in the bow to level out the trim. The starboard gunwale is cracked amidships, giving the boat a sharply-angled outline. 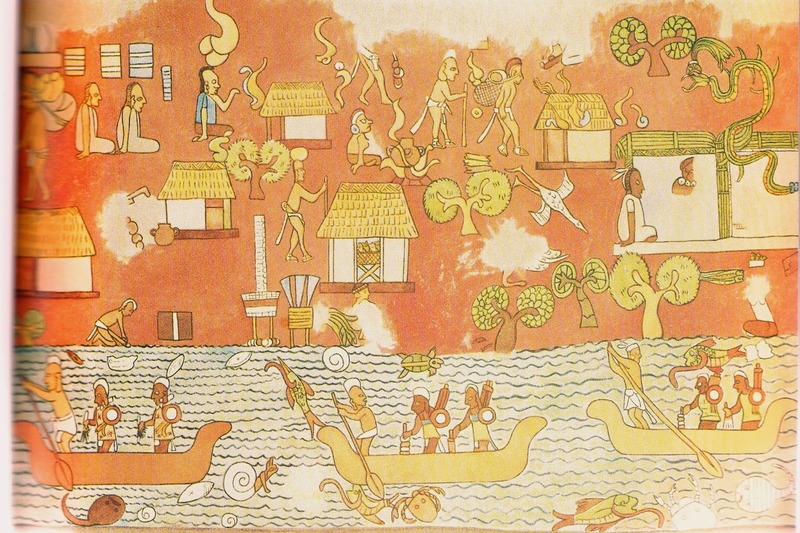 The Maya, whose civilization was based in the southern Mexico (including the densely forested Yucatan Peninsula) and parts of Central America depended heavily upon waterborne transport to supply goods to their several urban centers. Within Mayan territory, goods traveled by river from the interior to coastal areas, and from the coast inland as well. Coastwise trade also occurred both among Maya and with neighboring peoples. "...there arrived at that time a canoe long as a galley and eight feet [2.5m] wide, made of a single tree trunk like the other Indian canoes; it was freighted with merchandise from the western regions around New Spain. Amidships it had a palm-leaf awning like that which the Venetian gondolas carry; this gave complete protection against the rain and waves. Under this awning were the children and women and all the baggage and merchandise. There were twenty-five paddlers...."
The cargo in this single canoe included clothing, tools, weapons, foodstuffs, wine and luxury items. Obsidian was also an important import. The reported width of 8 feet seems unlikely for a logboat. Although no Mayan boats have been recovered, there is ample evidence that dugout canoes were the standard means of transportation. Aside from the matter of size -- we can safely assume that river craft were smaller than seagoing boats -- Maya canoes took several forms. Incised illustrations appearing on bones found in a royal burial in Tikal depict some of these variants. 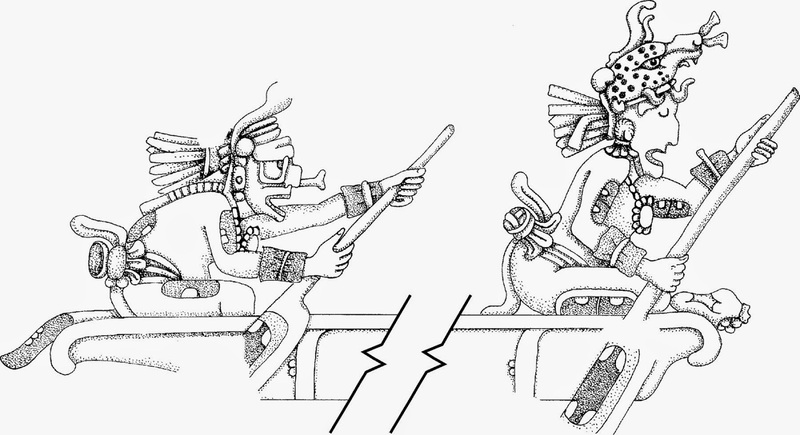 Mayan illustration showed most objects in profile, which limits our understanding of the canoe designs to that view, but shows some clear differences in sheerline, end decoration, and in the forms of the stem and stern. 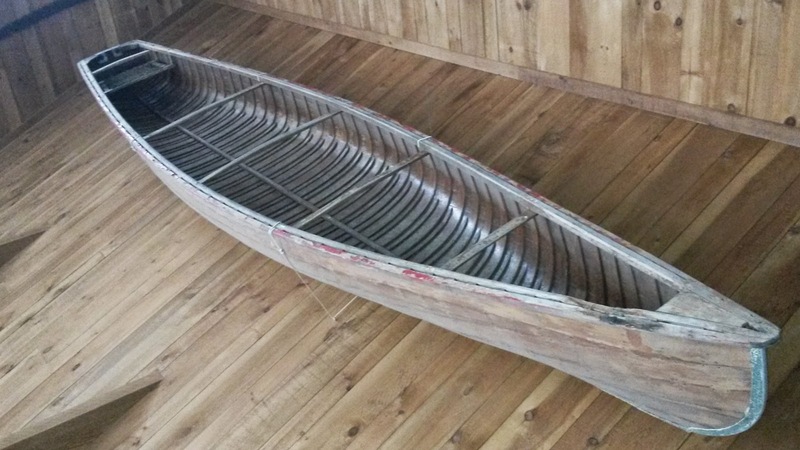 This canoe has an even more elaborate raised stem, shown in perspective overlapping two other fancy canoe bows. Two gods fishing from a canoe. The straight sheer and overhanging end platforms are less ceremonial, more appropriate to a workboat. 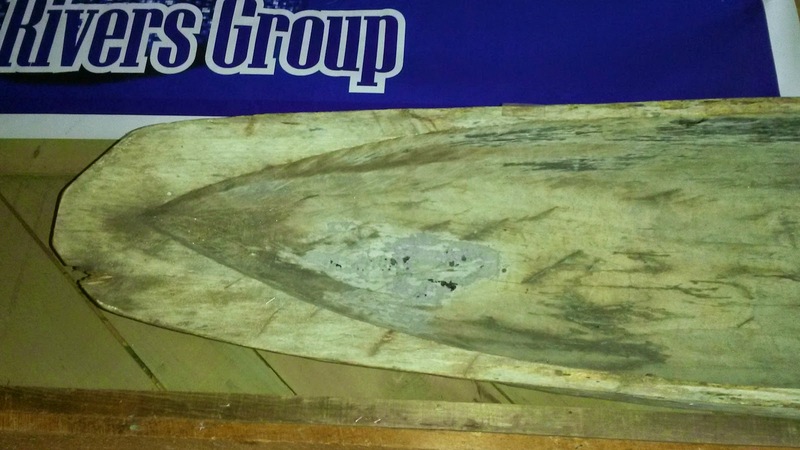 Found in Maya territory on Moho Cay, off the coast of Belize, this canoe model agrees with the previous image, including the straight sheer and the overhanging platform ends. 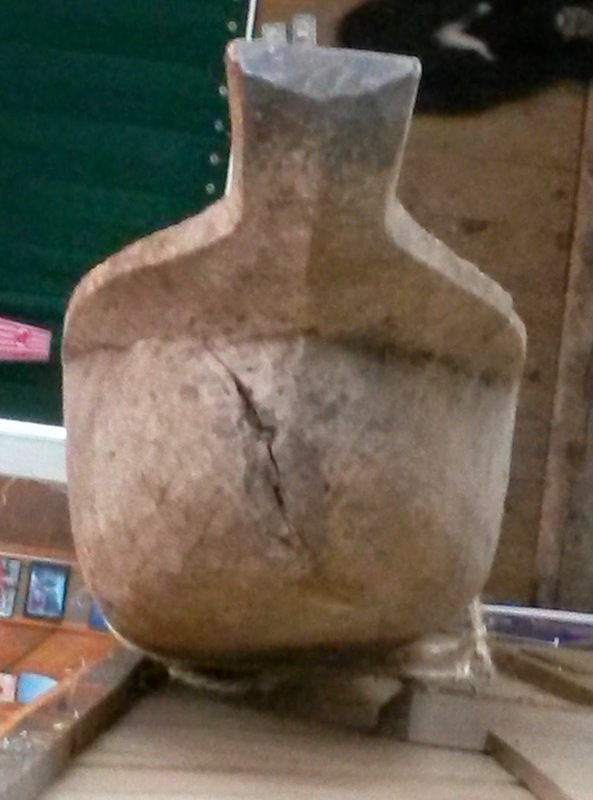 The model, possibly a child's toy, was made from manatee rib. 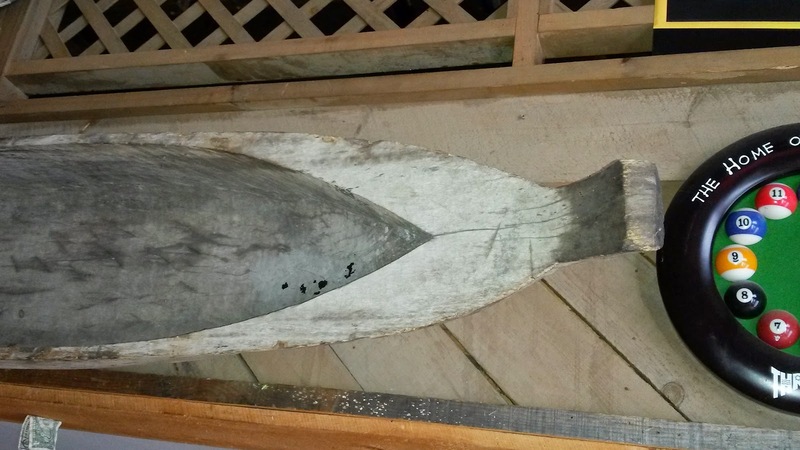 It's not clear if the tapered shape is an accurate representation of the canoe form, or if it was necessitated by the taper of the bone from which it was carved. 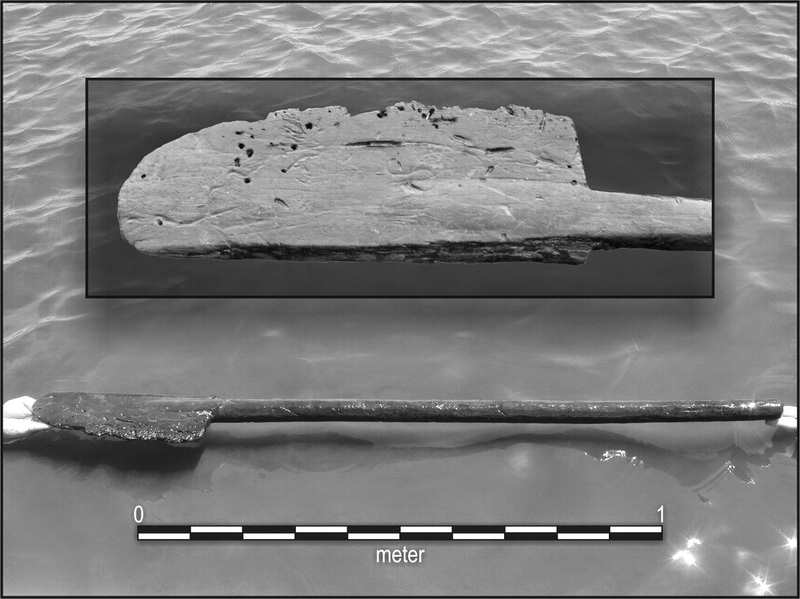 A paddle discovered at a Mayan saltworks on Punta Ycacos Lagoon on the Yucatan Peninsula in Belize agrees almost perfectly with those in the image above. The paddle does have a very narrow bit of blade opposite the main part of the blade. Total length is 1.43m. The shaft is round, 5cm diameter. The association of the paddle and the saltworks indicates waterborne trade in salt. A temple fresco from Chichen Itza shows three canoes traveling coastwise, each carrying two warriors. The canoe ends are high and similar to image #1. The single "paddler" in each boat appears to be using his long-shafted paddle to pole from the bow. The paddles have conventional symmetrical blades. So important was coastwise trade that the Maya established aids to navigation. Marks were erected on trees, and even the massive citadel of Tulum appears to have served at least in part as a lighthouse. 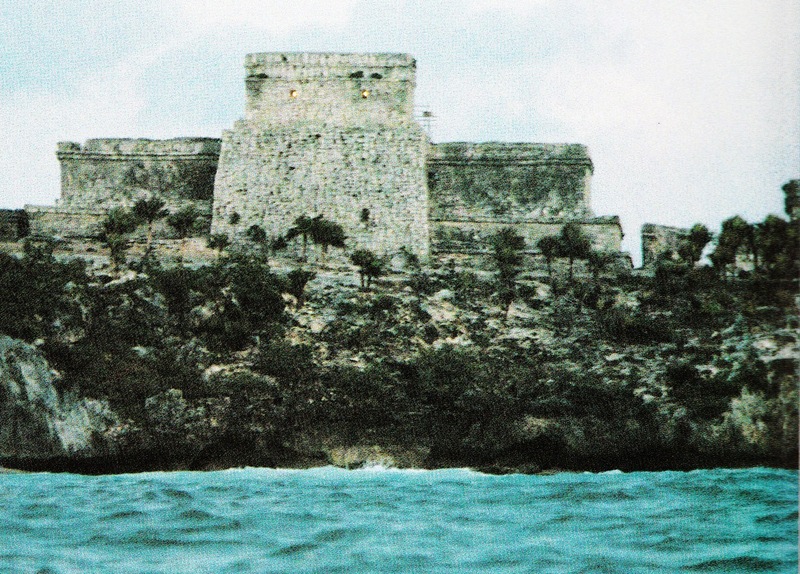 At Tulum, two windows in the thick stone walls of El Castillo's upper level face directly toward the harbor entrance. When illuminated from within, the lights would be clearly visible only when a canoe is properly lined up to pass safely through the gap in the protecting coral reef. With one exception, all content is from "The Earliest Watercraft: From Rafts to Viking Ships" by Margaret E. Leshikar, in Ships and Shipwrecks of the Americas: A History Based on Underwater Archaeology, George F. Bass, Editor, Thames & Hudson, NY, 1988. The content about the Punta Ycacos paddle is from "Finds in Belize document Late Classic Maya salt making and canoe transport," Heather McKillop, Proceedings of the National Academy of Sciences of the United States of America, vol.102, #15.